Get updates and announcements on screenings, bonus content, and more! Rebooting the Three Mile Island nuclear incident of 1979, MY FATHER, THE OLD HORSE chronicles an unforgettable hunting trip made worse by father-son tensions and a terrible secret with serious repercussions. 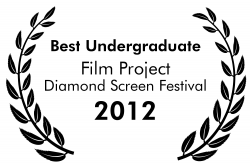 In a shorter version, the film won "Best Undergraduate Film" at Temple University's Diamond Screen Film Festival where it served as Max Einhorn's thesis film project. We hope you enjoy our "novella sized short," with a running time of 41 minutes- the equivalent to watching one of your favorite hour long network dramas, commercial-free, on-demand. Max Einhorn graduated from Temple University's Film and Media Arts program in spring 2012. After graduation, he continued work on the film while working for producers such as Anthony Bregman (BEGIN AGAIN) and Ross Katz (BROTHER'S KEEPER), sales company FilmNation Entertainment (THE KING'S SPEECH), and most recently for director Henry Pincus in a development capacity (WISTERIA HYSTERIA fashion film). Longterm, Einhorn hopes to make MY FATHER, THE OLD HORSE into a television series about a small town dealing with Chernobyl-scale nuclear fall-out. Love indie film? Follow us!